Having studied extensively in the fields of bio-mechanics of yoga, yoga therapy, massage ,and life coaching, Bridget brings her deep curiosity, passion for personal growth, and love of anatomy and movement to her classes. She shares her teachings in a deeply authentic, grounded manner, inspired by values-driven, integrated yogic living. Alec Butterfield, RYT 200 has been teaching Monday evenings at Supersoul since the summer of 2015. Earlier that same year, he completed yoga teacher training with Sondra Loring and Raghunath. Alec is the owner of Navanita Wellness, founded in 2018. Alec holds a BA in Psychology and currently works full time in the mental health field as a case manager for children and their families. Along with a range of other interests, he operates at the emerging intersections of yoga with psychology and mental health. is trained in several methods including Iyengar, Restorative and Yin. To give back, she leads yoga classes in the addiction recovery community. Alexandra has a background in exercise science and an interest in Kinesiology. Her spiritual philosophy is deeply influenced by teachers in the non-dual or Advaita tradition and Buddhism. She lives in North Chatham with her husband. Rosy Mulligan is a Yoga teacher, specializing in Prenatal Yoga, Postnatal Yoga and Restorative Yoga. Rosy began her yoga career in the Himalayas in 2012. Since then her love for yoga has expanded to reach many aspects of her life. Rosy has worked as a birth doula and is trained in prenatal yoga which she offers as a way to prepare for birth and mothering. Rosy is passionate about kirtan and sacred chants, weaving powerful mantras from different traditions into her classes. Rosy takes inspiration from different paths of yoga to create a vinyasa flow which is rooted in tradition and thoughtful inquiry. Peggy is a passionate teacher of both Yoga & Pilates. With over 20 years experience, she brings an intimate understanding of the body and a playful creativity to her classes. After graduating from SUNY Purchase in 1987, Peggy spent 10 years touring and performing as a professional dancer. She was first drawn to the contemplative, internally motivated nature of Yoga as a counterpoint to her vigorous dance training. Soon though, her practice blossomed into a guiding light in her life. Introduced as rehabilitation for a dance injury, Pilates allowed her to find the strength and balance that her body needed to heal and, when performing turned to teaching, Peggy opened Finetune Pilates Studio in Brooklyn where she shared this incredible body of work with others for over 17 years. A perpetually curious body nerd, Peggy is influenced by classical and contemporary Pilates lineages, Anusara Yoga, Buddhist studies, somatic meditation, the Alexander Technique, anatomy & neuroscience particularly the myofascial work of Tom Meyers. Since relocating to the Hudson Valley in 2016, Peggy is taking time to breath the fresh air and enjoy the expanse of the ever changing horizon. Her new venture, The Spring Inside, creates a space for teachers (& enthusiastic movers) to explore our body’s innate intelligence through unique workshops & trainings and skilled mentorship. Lauren began practicing yoga in the mid-1980s in New York City with Allan Bateman. In 2016 she earned her 200-hour teacher training certificate, studying with Sondra Loring and T.J. Macchiaroli. Then in January 2018 she completed a 300-hour advanced yoga training program in India with Raghunath. She considers herself very fortunate to have practiced with and learned from so many wonderful teachers and tries to channel their knowledge, wisdom and compassion in her own teaching. Co-founder of Supersoul Yoga and Supersoul Farm, Raghunath started practicing yoga in 1987 with Sri Dharma Mittra. He lived 6.5 years in a Krishna Bhakti ashram studying sacred literature and music and began traveling to India's holy places. 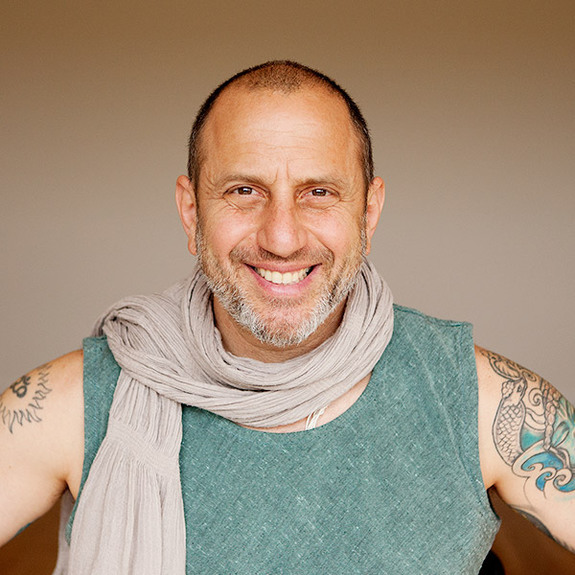 Today, he leads retreats, workshops, and teacher trainings around the world and is an expert at taking the esoteric yoga philosophy and making it understandable for the contemporary world. John is an Architect, Builder and Consultant specializing in sustainable design and believes that Yoga is the practice that creates sustainability within the internal environment. His personal practice began in 2009 at Revolution Yoga on Long Island where he began to feel the benefits of a regular asana practice, spiritual community, devotional singing and studying of spiritual texts. He has since completed his Yoga teacher training as part of Supersoul Yoga's first 200 hour training class and intends to serve his community by passing on the teachings and experiences that he was offered by his teachers. Melissa Forbes’ initial inspiration came from the yoga scholar Krishnamacharya and his son, Desikachar. Her studies began in India with Pattabhi Jois in 1990. She was a co-founder of The Heart of Yoga Association and is a graduate of the American Viniyoga Institute E-RYT 200. Melissa had the honor of accompanying U.G. Krishnamurti, a Jivamukti, in his travels during the last five years of his life and is the author of “No Teaching Yoga: The Authentic Guide,” published by Gatherinsight, a reflection of her spiritual journey. Recently, her Yantra artwork was acknowledged in December 2016 issue of Yoga Journal magazine for the suggested buyers list, September 2017 article called “Power of Design”, and illustrates the 2017 release of Karttikeyan Yogic Method, author Samyama, published by Balboa Press, among other publications. Melissa has shared her knowledge with different cultures around the world. Every February she leads an annual South India sacred painting tour and retreat at Shreyas. She continues helping others awaken to their true purpose in life and to foster the connection between all people. Stephanie, a mother of two and native to Columbia County enjoys long nature hikes, gardening and integrative health. Stephanie started her yoga practice in 2011 as a form of physical improvement, but did not know the many more benefits it would bring to her life. At that time she was a single mom who learned a lot about patience, respect, and self-reflection. Our amazing community and Supersoul has helped her grow and provide a strength within herself that she looks to share with others.She holds much gratitude to her teacher, Raghunath and the many other teachers at Supersoul who have changed her life in a huge way; opening her eyes to something bigger than herself and allowing her to grow. Bhakti has inspired her to ensue bigger things and inspire the spirit of love that we can see in ourselves and share with others. completed her 500hr training at Kripalu, having studied pranayama (breath exercises) and meditation in-depth. Her goal as a yoga teacher is to provide a uniquely personal inner experience for each student. Using guided relaxation, matching breath with body movement, and using precise alignment cues to create body awareness, empowering each individual to feel in control of their practice. Zoey finds importance in creating an all inclusive safe space for students to show up, drop in, and receive the stress relieving benefits of yoga. Mary Flinn (MFA, RYT E500 and Ayurveda consultant) has been teaching Yoga internationally and nationally since 1995. Also a guest teacher at the Tokyo Yoga conference in Japan in 2007. She received her Ayurveda Consultant certificate from ‘The Insititute of Vedic Studies’ and ‘The Dixit Ayurveda Aarogya Dharma’ in Mysore India. She has been blessed by the Late Shri K. Pattabhi Jois and his Grandson Sharath Rangaswami to teach the first and second series of Ashtanga Yoga and was also a student of the late Yogi Bhajan founder of Kundalini Yoga. Mary is also an artist and is looking forward to painting and teaching Yoga in upstate NY. For more see her website Maryflinn.com.